Unless they electro-shocked that pond again since last May, they'll still be around. They shocked that pond quite a few times, but obviously it didn't completely eradicate the bass and other unwanted species in there. Was there last weekend, no luck. What were u using trivium? I live right by there so I go quite often for a quick fix. This time of year is usually slow, but there are tons of little guys in there. I usually go with a wedding band, any sort of small spinner, or a surface popper and the little guys love it. There's also small pumpkinseed and some big carp if you want to target them. Sorry for pushing this up but I was wondering if anyones been there recently and what they caught and how. I'm planning on hitting it tomorrow as I get the day off. Any info is appreciated, and carp bait there is especially appreciated. I was there yesterday for a bit, caught a handful of little bass and saw some big carp splashing around. Caught them on a variety of lures: pink wedding bands, small silver/pink spoons. All were caught on the fountain end of the pond, didn't venture too far down. Tried some leech pattern flies but no activity, so I would stick to something more flashy as listed above. A variety of spinners, wedding bands and grubs. I also brought some bread invade I saw a carp. Saw about 10 carp suspended just under the surface there today. At the end of the pond closest to the entrance, directly across from where the security post is. 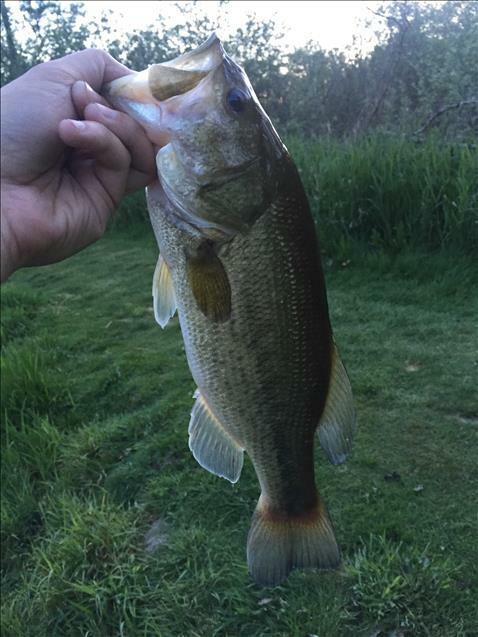 My friend and I had each caught a small bass around 4-5" lol. Lots of fish around (mostly small), can't believe all the sunfish in there now. Did see two 1 lb+ bass cruising the shallows. With the sunshine we had today, I realized how shallow that pond actually is. That explains how I lost a good $20 worth of lures in recent past visits. Dylb, was that you there today fishing in the blue shirt? Trivium, no man that wasn't me. I do frequent there though, as I live so close by. Good for a quick fix after work. I haven't pulled any decent sized bass out of there lately, but there's a handful. It is shallow, has deeper pockets and a lot of bottom growth where they all hang out. I've tried bottom jigs in there hoping to coax out some bigger bass but it's just too damn weedy and soggy. The little ones are definitely more abundant and quicker to bite. 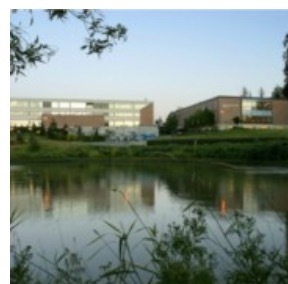 I have a feeling the bigger bass hold tight to that thick matted vegetation in the far end of the pond. It's damn near impossible to fish that end, unless you're using a frog. Might be able to throw a Texas rigged plastic in there as well, just along the weed line. From my past experience at Trinity, May should be prime time for catching bass in there. That's when I had all my luck last year. I stopped fishing once June rolled around, cause the pond was completely weed choked. Didn't catch anything over 1lb. Incase anyone was curious, the water at Trinity is warm as pee right now. Caught about 10 within 1.5 hours around 6-730pm the other day. They were taking anything. What's your biggest bass out of there so far Dylb? I stuck this one today, just before 8:30 pm. Hanging around one of those weed patches. It's my biggest fish out of there so far, 1.5lbs on the scale. Caught it on a texas rigged soft plastic bait. Nice catch! What bait were you using? I haven't weighed any but there's been a couple that might be close to that, not for quite some time though. Lately it's been like fish in a barrel at the fountain end of the lake... but nothing of decent size. What area of the lake were you at? I was fishing in roughly the middle of the pond, if you enter the trail from where the fountains are. Where the bench is about midway, there's a small patch of thick weeds on top of the water close to the shoreline. I was just flipping the bait around it, seems to be only about 2' deep in that spot. I tried doing the same at the far end of the pond with all that thick weed. Just casting into the open spots, not even a nibble. It does seem a bit deeper, I'm sure there's gotta be a couple decent fish hanging around there. The only other thing that you could really try is a topwater frog, again throwing it in those open sections and working it along. As for the plastic I was using...I can't give away all my secrets But really, any soft plastic should work as long as it has a good action on the fall, and when hopped off the bottom. I would suggest darker colors, with some kind of flake in it. boomdraco, the only place that I've seen the "senko" style worms around here is Wholesale Sports. They're called YUM "dingers" 4 inch I believe. They were almost sold out of em the last time I was there (early last week), they only have a few funky colors left. Try and get one with a flake in it, if you can. My son and I went to Trinity over the weekend and didn't catch anything. Not even a nibble. We fished around most of the pond. It's the earliest in the year we've been, but I wonder if they shocked it again last year? Also, didn't see the carp on the end that we normally see. We then fished the creek right next to it. Caught a Pikeminnow and 2 trout. The Pikeminnow had two smaller fish in its mouth. All were released, then I thought maybe I should have killed the Pike, considering some believe it's invasive and there is a daily limit of 15. Speaking of which, did you notice the regs. this year raised the limit of largemouth bass to 20! No mention of smallmouth. Just to clarify a few points. Northern Pikeminnow are a native species. They are not listed as a game fish in B.C., and to the best of my "Google U." knowledge there isn't a daily limit. The name sometimes gets confused with Northern Pike which is a game fish in B.C. Smallmouth bass have been reported in Region 2 but I believe it's only 2 reports with no follow up positive ID. So the 20 bass per day is largemouth in Region 2, as there seems to be no smallmouth here. Have heard reports of some carp in TWU pond, that have been seen sunning themselves on those very rare sunny days that we've had so far this Spring. I think I saw something on FWR website saying the same of Pike Minnow. Native. But can be damaging to the local ecosystem. Is it ethical to kill, but not eat? The ethics of killing a pike minnow are up to the individual. I don't as I don't think I have the information or knowledge to determine the effect, positive, negative or any effect at all on a particular water body, by killing a couple of pike minnows. They seem to have evolved and found their niche, so I'm "live and let live", at this time. Pike minnow are not in the whitefish family. Whitefish have an adipose fin, and pike minnows don't. That's the easiest way for me to tell the difference.